History: For many years Casa Jurado was one of El Paso’s most popular restaurants, serving the classic “El Paso style” Mexican food. This was characterized by red and green chile enchiladas, a large variety of items (some of which seemed to be unique to the El Paso area), and the fact that it contained elements of New Mexican cuisine as well as authentic dishes from Mexico. In the meantime, a second location opened on Doniphan Drive in El Paso’s Upper Valley, known as Casa Jurado West. This was operated by another Jurado family member, and had food which was much the same as at the original location. Henry Jurado, the long time owner and manager of the original Casa Jurado, sold the restaurant in 2004. The new owners continued the same menu as before, but long time customers seemed to notice subtle changes to the food and began to come less frequently than before (they kept the same cooks and waiters that had been at the old Casa Jurado, but there was enough variability in the food that I wasn’t always sure it was still the “same old” Casa Jurado). The restaurant closed in 2010. I think changes in the food were not the only reason for this, or even the main reason. At the time the “Cincinnati District” was going through drastic changes, becoming more of a night club scene than the traditional shopping and restaurant district that had been there before. It became almost impossible to find a parking spot even if you wanted to go to Casa Jurado, and the restaurant just did not fit the neighborhood very well any more. Casa Jurado West is still operating with the traditional Jurado family recipes. I never liked it quite as much as the original restaurant, but it is nevertheless one of the top “El Paso style” restaurants in the city. The following review was written after the ownership of the original restaurant changed, and is a description of the “post-Henry” restaurant with allusions to the original. 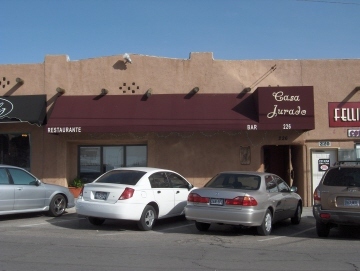 Casa Jurado is not only an El Paso institution, its Kern Place location is in one of the city’s most interesting neighborhoods. Surrounded by several bars, coffee houses, and other restaurants, Casa Jurado itself is decorated with bright colors to convey the feeling of festivity felt throughout Cincinnati Avenue. Casa Jurado gained a reputation through the years for the quality of its food, and I believe one secret to its success was the constant attention by its long-time owner. When Henry sold the restaurant in 2004, however, the big question became whether the quality could be maintained. For a while the food did not seem to be the same as when the Jurado family still had the restaurant. However, through keeping the same cooks and waiters the restaurant has maintained a continuity so that as of 2007 it seems to be the same “Casa J” as before. In theory, the food should be even better now than before. 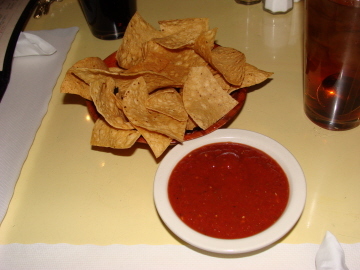 The Salsa is the only item that has been purposely changed to a more fresh and light flavor. I think it is still pretty heavy on the comino but I thought it was good. If you wish to take a taste test you can try the one at Casa Jurado West which still serves the original salsa. A conscious effort has been made by the owner of the Casa Jurado in Kern Place to keep things fresh by making the food daily and not keeping anything overnight. One time I went they had run out of green sauce for the enchiladas because they had more customers than anticipated that day, and the sauce is only made in small batches that would not be prepared again until the next morning. This also means that if you go in the evening not everything on the menu might be available. 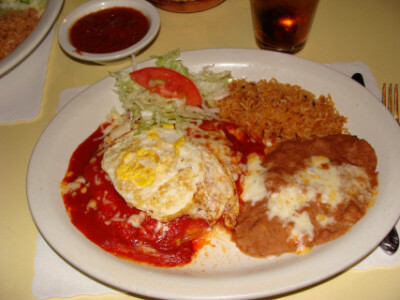 Enchiladas Norteñas was my favorite dish at the old Casa J., and currently at the Doniphan (Casa Jurado West) location. This is characterized by a distinctive dark red sauce with a well-balance chile flavor that has been one of my favorite enchilada dishes in El Paso (partly because the enchiladas are stacked instead of rolled). When I tried them shortly after the changeover they had too much garlic and had been transformed into a bright red sauce that was little different from countless restaurants in the city. Based on my recent experiences at the restaurant I suspect they are now back to the original style, but without ordering this specific dish I cannot make a rating of it. It does seem, though, that the restaurant tried to change at first, then went back to the original way of doing things that made Casa Jurado a success in the first place. My recent experience with Chicken Flautas was quite good, and convinced me that Casa Jurado is once again among the best Mexican restaurants in the border city. If you have ever had a “perfect” order of flautas where the shell, guacamole, and side dishes (beans and rice) were done just right, you will know what the ones at Casa Jurado were like. The flute shaped taquitos were small, without much meat filling, but this is the classic way of serving them. From the freshness of the lettuce served on the side to the refried beans, everything seemed the same as some of the excellent flautas served in Ysleta, Socorro, and San Elizario, where I think the best examples of the dish are normally found. The only component of the flautas that I thought was less than perfect was the chicken that had a flavor I frequently encounter in Mexican food, but that I nevertheless do not like very much (kind of a dry taste). Still it was good, and next time I will probably get beef flautas. Even if you order chicken, I still highly recommend this dish. At the old Casa J. the Chile Relleno was one of the best items (the melted cheese inside was the best part of it). I have not tried the relleno recently, but it is likely still the same. Chicken Mole used to be very good. It is a matter of taste on this dish, but currently I like the version at Carnitas Queretaro the best. Salpicón has always been the restaurant’s specialty–a type of beef salad that is served cold. It actually reminds me somewhat of the lab salad served at Thai and Lao restaurants. One of the best dishes at Casa J. used to be an order of Green Enchiladas. Although they came with the typical puréed green chile, a waiter who knew me (and who still works at the restaurant) suggested that the cook add green chile strips on top to make them spicier. This may cost extra, but I think it would be so worth it. Rice is still excellent and is one of the few examples in El Paso where the cooks seem to take as much care to cook them properly and keep them heated as they do with the main dishes. Refried Beans are better than before. It could be that they have now started using vegetable oil, but I really do not know the reason they seem to be so good. One of the toppings for flautas is Guacamole, which is also quite a good dish in itself. The one here is fresh and flavorful, and one of the best in El Paso. 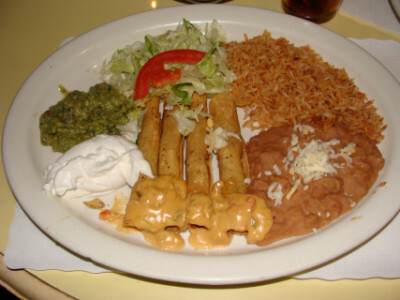 The flauta plate comes with Chile con Queso on the side, or this can also be ordered as an appetizer. I thought the one here was fresh and flavorful, and was the type of queso that could only be dreamed about in most Oklahoma Mexican restaurants. The Tex-Mex restaurants in other parts of the country usually give a comlimentary serving of something called “queso,” but which is so far removed from the one served at Casa Jurado I am not sure they are made with the same ingredients. A waiter told me the one here was made with Velveeta (something I am pretty sure is used in the Tex-Mex restaurants), but mixed with Monterey Jack cheese that I think gives the Casa J. queso its special flavor. Of course, the fresh chiles inside are also a key ingredient. I should also mention the fact that the Chips at Casa Jurado are thick and flavorful, and are some of the best in the city. The ones at the “old” restaurant were good, but I do not remember them being this good. The Flan over the years has been one of the best I’ve eaten. I am glad the new owner is taking a serious approach not only in maintaining the Jurado family traditions, but also in making improvements that are noticeable. If some of my previous disappointments have now been rectified, the restaurant can now be considered better than before. I think it is at least close to the type of food Henry brought us for a number of years.